It is time again to assess how I am doing on my 2012 goals. My research has gone in a couple of different directions. 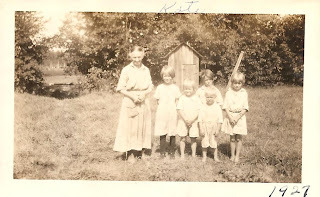 I have been corresponding with three Fredrick cousins, so my research has been on that line of my family. Education seems to be the easiest to complete. There are always webinars available. I have had to start limiting the ones I attend, or that is all I would do. I was successful in completing my organizational goals so that is good. Here are my goals and how I am progressing. I haven't done anything new in March or April. No new progress has been made. I need to verify a couple of things before I confirm and post the information. Plus, I went to Allen County Public Library in Fort Wayne, Indiana for a day of research. 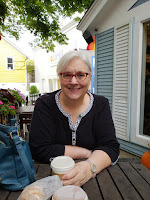 I met up with other Midwestern Geneabloggers and had a great time. Irish-American Catholic Genealogy by Michael Brophy. This webinar covered everything you need to know about Irish American Catholic Genealogy. 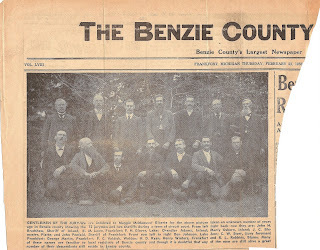 From lost records, to available records, to cemeteries, church records, newspapers, fraternal organizations and more. The 1940 Census by Thomas MacEntee Thomas gave a great webinar on the 1940 Census. He explained what is new in the 1940 Census, how to acquire the enumeration district using Steve Morse.org and more. Using a Blog as Your Online Research Log by Drew Smith. This was an informative webinar on blogging. It wasn't what I thought it was going to be, but it was a refresher for me on the use of blogger. Top 20 Lessons Genealogists Need to Know by Barry Ewell This very informative webinar came with great handouts. Barry covered everything from verify your data, to cite your sources, think like a historian, organize your data, to technological helps. Making the Most of the Canadian Census by Kathryn Lake Hogan Kathryn does an excellent job presenting Canadian information. I was sorry I had to miss her webinar on Canadian Ports. The Census webinar presented where to find the records and the schedules that are available for Canadian census research and more. Obituaries: Clues to Look For by Tom Kemp. Ok, Mr. Kemp, you did such a good job you cost me money! After viewing this webinar I signed up for a Genealogy Bank subscription. I haven't found any obituaries yet, but I have found other articles I will be sharing soon. Reverse Genealogy: Finding the Living by Megan Smolenyak If you have ever wanted to find living relatives than this webinar is for you. I couldn't believe that it was Megan Smolenyak's first webinar. Sections, Ranges, Townships by Bobbi King. I should have watched this course last year when I was using the Bureau of Land Management records. Ms. King gives an excellent presentation on Metes and Bounds and the Rectangular Survey system. I remember learning this in junior high, but didn't retain a lot of it. Ms. King walks you through the reading of legal land descriptions. U.S. Courthouse Research by Christine Rose. This was a fun course to view. It includes an interactive visit to a courthouse with helpful tips on researching in a courthouse. A handout was included with this research course. And, I attended a genealogy class at Helen Warner Branch of Willard Library on "Finding Military Records". Do you have any suggestions for research wiki's or courses? Please share your ideas in the comment section. I am done!! Of course, I had to buy another file cabinet for all my red folders. We live in a world where we get impatient when we have to wait. We don’t want to wait in line at the store, the drive-through or in traffic. The same can be said for genealogy. We want it now! A popular genealogy business perpetuates this with its’ latest commercial and its’ shaking leaves. In order to grow as a genealogist you, and I, must learn to wait. Waiting for genealogy will give us our best research. It will give us an accurate direction to go in. If we rush ahead without using solid research principles we will make mistakes, some of which we may regret. Don’t be impatient to gather names, facts or sources. Take your time, be patient, and keep researching. You will be thankful you did. When I first started my research, I made a few mistakes. If I had waited and taken the time to thoroughly evaluate the information, I wouldn’t have had to re-do some of my research, or go back to find what source I used. · You will be disappointed. No matter how great you think the information is-if you don’t thoroughly evaluate it, later on it will lead to disappointment. · You will have lost the best information. It’s like settling for second best, and I use that term 'best' loosely. · You will bring upon yourself extra work. You will have to go back over your research, correct mistakes and source it. This takes away from time that could be used for new discoveries. · Other people get hurt. They will use your information, put it on an online tree for all to see, forever!, and that affects all genealogists. A minister once said, “Our willingness to wait reveals the value we place on the object we are waiting for.” Do you value your family history enough to wait? Waiting will give you what you really want, not what you think you want. Waiting will give you the best and that is what you are waiting for. You and other genealogists will benefit from waiting. 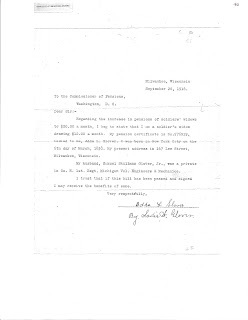 I have found a lot of information in Samuel S. Glover Jr.'s Civil War Pension File, but the information I treasure the most is the pages that his wife, Adda L. Dyer Glover submitted herself. The only information I had on Adda L. Dyer, prior to ordering the pension file, was found in her marriage record. I had her maiden surname and date of marriage. Samuel's pension file filled in a few blanks for me. 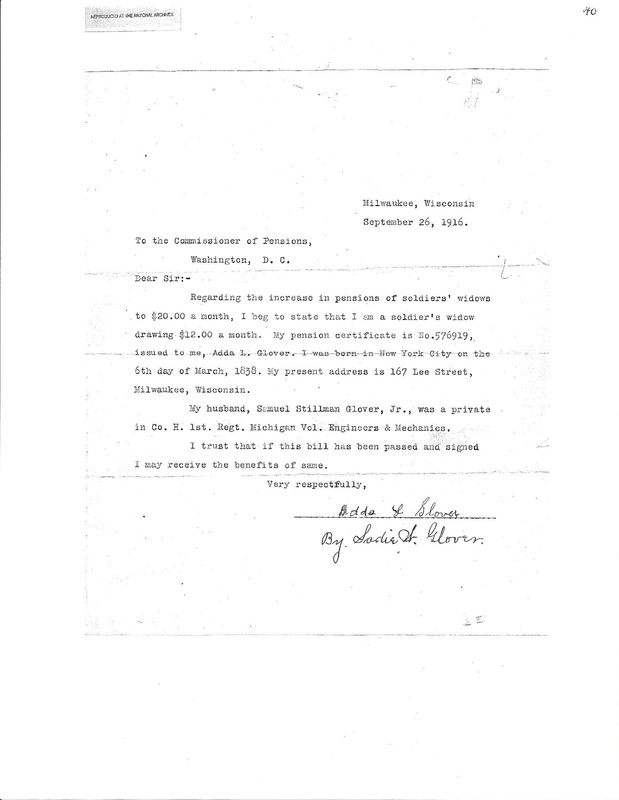 The letter below is one that Adda L. Glover wrote asking for an increase in her widow's pension. She gives her date of birth, place of birth and residence in 1916. This is the only proof I have of Adda's birth, so far. All great information that led me to other resources on Adda L. Dyer. (Washington, D.C.: U.S. National Archives and Records Administration), p 40.
in Co. H. 1st. Regt. Michigan Vol. Engineers & Mechanics. I may receive the benefits of same. 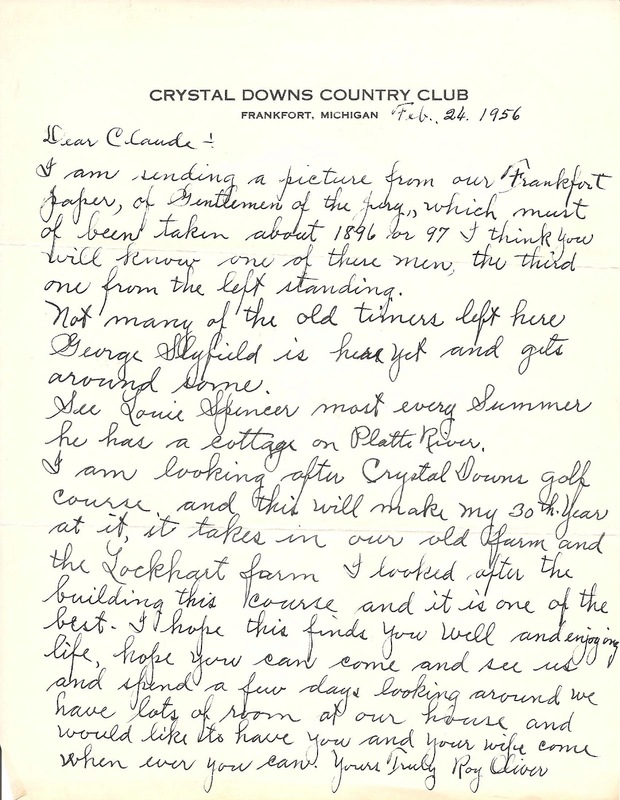 from Roy Oliver, Crystal Downs Country Club, Frankfort, Michigan. Postmarked Feb 24 1956, 6PM sent with three cents postage stamp. I am sending a picture from our Frankfort paper of Gentlemen of the Jury, which must of been taken about 1896 or 97. I think you will know one of there men, the third one from the left standing. Not many of the old timers left here. George Slyfield is here yet and gets around some. See Louie Spencer most every Summer he has a cottage on Platte River. 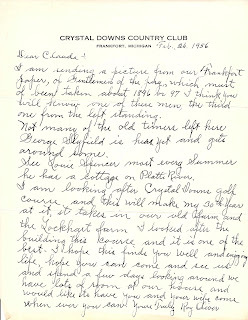 The newspaper clipping Mr. Roy Oliver sent along with the letter to Claude Glover. 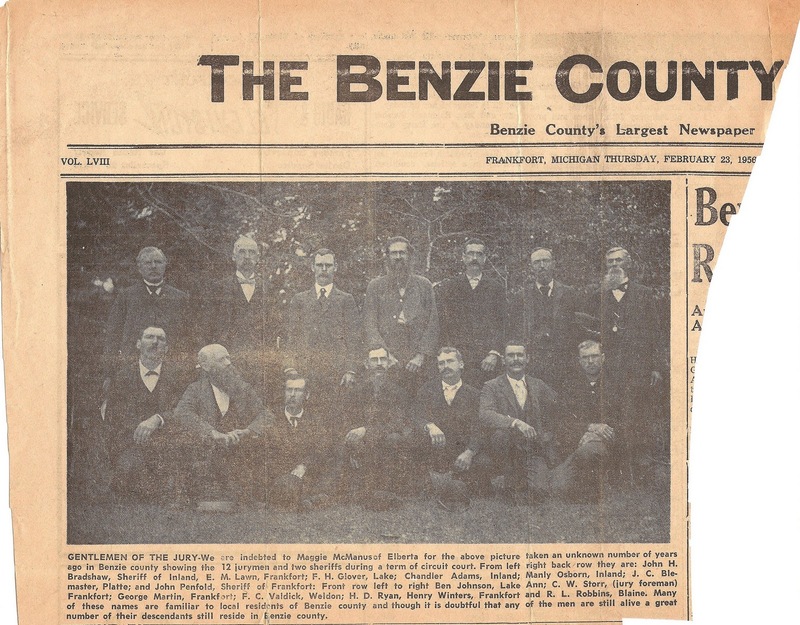 Claude's father, Frank H. Glover is third from left, standing. Where in the World is Otto August Fredrick? 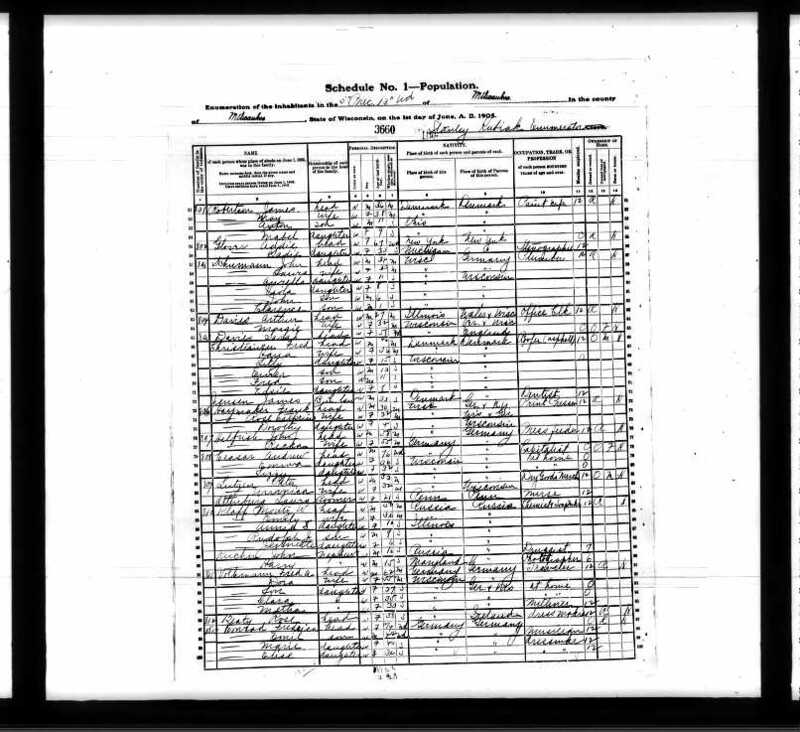 My maternal grandfather, Otto August Fredrick, can be found in the above census records. I have not been able to find him in the 1910 Census. I know my grandfather worked/sailed on the Great Lakes. I would guess he was missed in the Census when he was out on the Lakes, but I don't know that for certain. 156 years ago today, my great grandmother, Louise Zastrow Fredrich, was born. She is pictured here at the age of 61 with five of her grandchildren. From left to right: Kathryn Louise Fredrick, age 9, Daisy Marie Fredrick, age 6; Otto Robert Fredrick, age 4; Lola Mae Fredrick, age 7; and Richard Lewis Fredrick, age 2. I spent many hours, at least ten hours a week, at the Health Center on the campus of Western Michigan University(WMU) in Kalamazoo, Michigan. I entered WMU in the fall of 1975 fully believing I was going to graduate with a degree in Medical Technology. Little did I know I would have to take chemistry for 8 semesters. Chemistry was not my friend. Since I had declared a major in Medical Technology I was happy when there was an opening in the lab and x-ray department at the health center. I was granted work study at Western and this seemed like the perfect fit. Although, I changed my major to Home Economics and Health Education I kept my health center job for four years. The lab and x-ray department was in the basement of the health center. I learned so much during this job. I drew blood, ran pregnancy tests, did throat cultures, cleaned test tubes, and a few other menial tasks in the lab. In x-ray, I developed the x-rays. 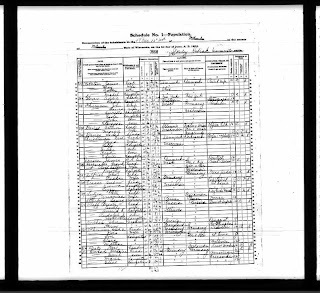 Source: Wisconsin State Census, 1905, Milwaukee, population schedule, Milwaukee, Ward 13, Wisconsin, p39, Family number 802, Addie Glover; FHL microfilm FHL Microfilm 1020994. 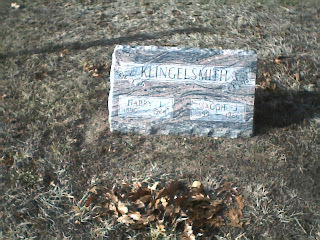 Harry and Maggie Jane (Graf) Klingelsmith are buried in Brethren Cemetery, Brethren, Manistee, Michigan. Maggie Jane Graf is the daughter of Valentine and Nancy (Mast) Graf, my maternal great grandparents. 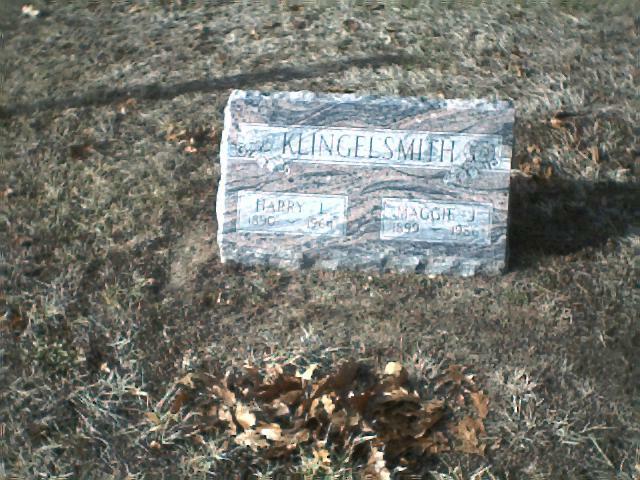 Maggie and my grandmother, Daisy Graf Fredrick are sisters.